Morning lovelies, hope you've all had a brilliant week. For me it's revolved around a few things: Medical dramas, AusBlogCon, avoiding any media mentions of Charlie Sheen, the conference next weekend, some general baby/house duties, and 'outing' myself in preparation for something... oh what was it again? Oh that's right, the Aussie Bloggers Conference! I've been thinking about what I want to get out of it, who I MUST meet, who I'm too nervous to meet (so will just stalk from across a crowded room), who I have to buy a drink for and yes, what I will wear to dinner. I'm calling the look Flintstone Chic. So if you're at the dinner next Saturday night, be sure to say hello and comment that my dress isn't only soooo 2009, it's soooo Stone Age. Ah the conference, I'm feeling excited and anxious about it. :) Only there for the day so hopefully I will have time to meet heaps of bloggers. ps I don't have the button up currently :( will reemdy that when I next have a computer I can access my blog at (work thinks it's "adult content"
You do make me laugh, you Stone Age chic chick, you. This year I'm going for the 'Caterpillar in a Sack' look. No cartoon could truly capture the awesomeness of it, you will have to see it in person. I know you revealed your name in your capitals (or something) in your post but with all the distractions going on here I can't work it out (dumb much?). I look forward to saying 'hi' at ABC if we manage to find each other with all the anonymity between us! 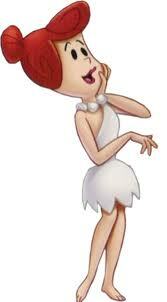 oooh I'd be wrapped if I looked as good as Wilma... you are totally going to rock the conference! I'm a nervous eater so you will find me at the buffet table, Marita! It's for all kinds of personal bloggers, Tork, there will be food bloggers, craft bloggers, and more! But I think there will only be one Daddy-blogger there, Colin from Super Parents. Reuse, recycle, reduce! Think of it as lowering your carbon footprint and all of a sudden you're uber cool. I'm predicting tickets will sell out in less than a day for next year's conference after this year's hype! See you next year, Kellie!